Marbury v. Madison, 5 U.S. (1 Cranch) 137 (1803), was a U.S. Supreme Court case that established the principle of judicial review in the United States, meaning that American courts have the power to strike down laws, statutes, and some government actions that contravene the U.S. Constitution. Decided in 1803, Marbury remains the single most important decision in American constitutional law. The Court's landmark decision established that the U.S. Constitution is actual "law", not just a statement of political principles and ideals, and helped define the boundary between the constitutionally separate executive and judicial branches of the American form of government. The case originated from the political and ideological rivalry between outgoing U.S. President John Adams, who espoused the pro-business and pro-national-government ideals of Alexander Hamilton and the Federalist Party, and incoming President Thomas Jefferson, who led the Democratic-Republican Party and favored agriculture and decentralization. Adams had lost the U.S. presidential election of 1800 to Jefferson, and in March 1801, just two days before his term as president ended, Adams appointed several dozen Federalist Party supporters to new circuit judge and justice of the peace positions in an attempt to frustrate Jefferson and his supporters in the Democratic-Republican Party. The U.S. Senate quickly confirmed Adams's appointments, but upon Jefferson's inauguration two days later, a few of the new judges' commissions still had not been delivered. 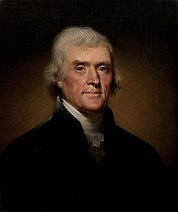 Jefferson believed the commissions were void because they had not been delivered in time, and instructed his new Secretary of State, James Madison, not to deliver them. One of the men whose commissions had not been delivered in time was William Marbury, a Maryland businessman who had been a strong supporter of Adams and the Federalists. In late 1801, after Madison had repeatedly refused to deliver his commission, Marbury filed a lawsuit in the Supreme Court asking the Court to issue a writ of mandamus forcing Madison to deliver his commission. In an opinion written by Chief Justice John Marshall, the Court held firstly that Madison's refusal to deliver Marbury's commission was illegal, and secondly that it was normally proper for a court in such situations to order the government official in question to deliver the commission. However, in Marbury's case, the Court did not order Madison to comply. Examining the law Congress had passed that gave the Supreme Court jurisdiction over types of cases like Marbury's, Marshall found that it had expanded the definition of the Supreme Court's jurisdiction beyond what was originally set down in the U.S. Constitution. Marshall then struck down the law, announcing that American courts have the power to invalidate laws that they find to violate the Constitution. Because this meant the Court had no jurisdiction over the case, it could not issue the writ that Marbury had requested. President John Adams, who appointed Marbury just before his presidential term ended. Thomas Jefferson, who succeeded Adams as President and believed Marbury's undelivered commission was void. William Marbury, whose commission Madison refused to deliver. James Madison, Jefferson's Secretary of State, who withheld Marbury's commission. As the results of the election became clear in early 1801, Adams and the Federalists became determined to exercise their influence in the weeks remaining before Jefferson took office, and did all they could to fill federal offices with "anti-Jeffersonians" who were loyal to the Federalists. On March 2, 1801, just two days before his presidential term ended, Adams nominated nearly 60 Federalist supporters to circuit judge and justice of the peace positions the Federalist-controlled Congress had newly created with the Judiciary Act of 1801. These last-minute nominees—whom Jefferson's supporters derisively referred to as the "Midnight Judges"—included William Marbury, a prosperous businessman from Maryland. An ardent Federalist, Marbury was active in Maryland politics and had been a vigorous supporter of the Adams presidency. The following day, March 3, the Senate approved Adams's nominations en masse. The appointees' commissions were immediately written out, then signed by Adams and sealed by his Secretary of State, John Marshall, who had been named the new Chief Justice of the Supreme Court in January but continued also serving as Secretary of State for the remainder of Adams's term until Jefferson took office. Marshall then dispatched his younger brother James Markham Marshall to deliver the commissions to the appointees. With only one day left before Jefferson's inauguration, James Marshall was able to deliver most of the commissions, but a few—including Marbury's—were not delivered. The day after, March 4, 1801, Thomas Jefferson was sworn in and became the third President of the United States. As soon as he was able, Jefferson instructed his new Secretary of State, James Madison, to withhold the undelivered appointments. In Jefferson's opinion, the commissions were void because they had not been delivered in time. Without the commissions, the appointees were unable to assume the offices and duties to which they had been appointed. Over the next several months, Madison continually refused to deliver Marbury's commission to him. Finally, in December 1801, Marbury filed suit against Madison in the U.S. Supreme Court, asking the Court to issue a writ of mandamus forcing Madison to deliver Marbury's commission. This lawsuit resulted in the case of Marbury v. Madison. An engraving of Chief Justice John Marshall made by Charles-Balthazar-Julien Fevret de Saint-Mémin in 1808. Marshall then confirmed that a writ of mandamus—a type of court order that commands a government official to perform an act he or she is legally required to perform—was the proper remedy for Marbury's situation. The specific issue, however, was whether a court, which was part of the judicial branch of the government, could give Marbury a remedy against Madison, who as Secretary of State was part of the executive branch of the government. The Court held that so long as the remedy involved a mandatory duty to a specific person, and not a political matter left to discretion, the courts could provide the legal remedy. 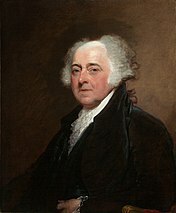 In a now well-known line of the opinion that borrows a phrase John Adams had drafted in 1779 for the Massachusetts State Constitution, Marshall wrote: "The government of the United States has been emphatically termed a government of laws, and not of men." The U.S. Capitol – home of the U.S. Congress, and also where the U.S. Supreme Court convened from 1801 until the opening of the Supreme Court Building in 1935. 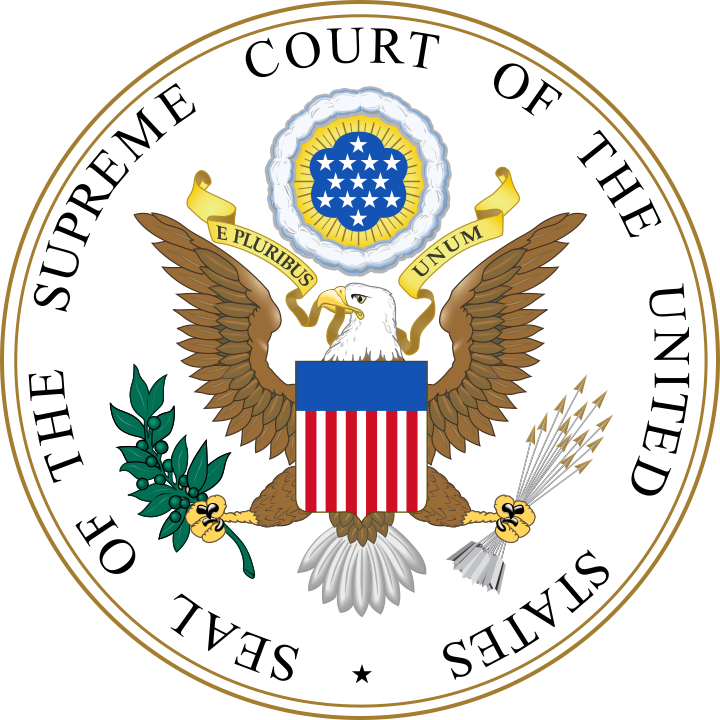 Congress had passed the Judiciary Act of 1789 to establish the American federal court system, since Article III of the U.S. Constitution only specifies that there is to be a Supreme Court, and leaves the rest of the federal judicial power to reside in "such inferior Courts as the Congress may from time to time ordain and establish." The Judiciary Act contained a section that defines areas in which the Supreme Court has original jurisdiction, and areas in which it has appellate jurisdiction. After ruling that it conflicted with the Constitution, Marshall struck down the relevant portion of the Judiciary Act in the U.S. Supreme Court's first ever declaration of the power of judicial review. Marshall ruled that American federal courts have the power to refuse to give any effect to congressional legislation that is inconsistent with their interpretation of the Constitution – a move known as "striking down" laws. Next, Marshall stated that deciding the constitutionality of the laws it applies is an inherent part of the American judiciary's role. In what has become the most famous and frequently quoted line of the opinion, Marshall wrote: "It is emphatically the province and duty of the Judicial Department to say what the law is." Marshall reasoned that the Constitution places limits on the American government's powers, and that those limits would be meaningless unless they were subject to judicial review and enforcement. He reasoned that the Constitution's provisions limiting Congress's power—such as the export tax clause, or the prohibitions on bills of attainder and ex post facto laws—meant that in some cases judges would be forced to choose between enforcing the Constitution or following Congress. Marshall then gave several other reasons in favor of judicial review. He argued that the authorization in Article III of the Constitution that the Court can decide cases arising "under this Constitution" implied that the Court had the power to strike down laws conflicting with the Constitution. This, Marshall wrote, meant that the Founders were willing to have the American judiciary use and interpret the Constitution when judging cases. He also argued that federal judges' oaths of office—in which they swear to discharge their duties impartially and "agreeably to the Constitution and laws of the United States"—requires them to support the Constitution. Lastly, Marshall argued that judicial review is implied in Article VI of the Constitution, since it declares the supreme law of the United States to be not the Constitution and the laws of the United States in general, but rather the Constitution and laws made "in Pursuance thereof". Chief Justice John Marshall as painted by Henry Inman in 1832, after having presided over the American judiciary for over 30 years. —  McCloskey & Levinson (2010), pp. 25–27. Marshall had been looking for a case that was suitable for introducing judicial review, and was eager to use the situation in Marbury to establish his claim. He introduced judicial review—a move Jefferson decried—but used it to strike down a provision of a law that he read to have expanded the Supreme Court's powers, and thereby produced Jefferson's hoped-for result of Marbury losing his case. In essence, "Marshall seized the occasion to uphold the institution of judicial review, but he did so in the course of reaching a judgment that his political opponents could neither defy nor protest." Though Jefferson criticized Marshall's opinion, he accepted it, and Marshall's decision in Marbury "articulate[d] a role for the federal courts that survives to this day." In the words of the American legal scholar Erwin Chemerinsky: "The brilliance of Marshall's opinion cannot be overstated." Given its preeminent position in American constitutional law, Marshall's opinion in Marbury v. Madison continues to be the subject of critical analysis and historical inquiry. In a 1955 Harvard Law Review article, U.S. Supreme Court Justice Felix Frankfurter emphasized that one can criticize Marshall's opinion in Marbury without demeaning it: "The courage of Marbury v. Madison is not minimized by suggesting that its reasoning is not impeccable and its conclusion, however wise, not inevitable." Criticisms of Marshall's opinion in Marbury usually fall into two general categories. First, some criticize the way Marshall "strove" to reach the conclusion that the U.S. Supreme Court has constitutional authority over the other branches of the U.S. government. In the present era, American courts generally follow the principle of "constitutional avoidance": if a certain interpretation of a law raises constitutional problems, they prefer to use alternative interpretations that avoid these problems, so long as the alternative interpretations are still plausible. In Marbury, Marshall could have avoided the constitutional questions through different legal rulings: for example, if he had ruled that Marbury did not have a right to his commission until it was delivered, or if he had ruled that refusals to honor political appointments could only be remedied through the political process and not the judicial process, it would have ended the case immediately, and the Court would not have reached the case's constitutional issues. Marshall did not do so, and many legal scholars have criticized him for it. However, others have noted that the "constitutional avoidance" principle did not exist in 1803, and in any case is "only a general guide for Court action", not an ironclad precept. Alternatively, it has also been argued that the view that Marshall "strove" to create a controversy largely vanishes when the case is viewed from the perspective of the late 18th century, when American colonies' and states' supreme courts were largely modeled on the British Court of King's Bench and its inherent mandamus powers. The subpoena duces tecum (order to bring items as evidence) issued to President Richard Nixon that was the center of the dispute in the 1974 judicial review case United States v. Nixon. Although the Court's opinion in Marbury established judicial review in American federal law, it did not create or invent the concept. Some 18th-century British jurists had argued that British courts had the power to circumscribe Parliament, and the principle became generally accepted in Colonial America—especially in Marshall's native Virginia—due to the idea that in America only the people were sovereign, rather than the government, and therefore that the courts should only implement legitimate laws. By the time of the Constitutional Convention in 1787, American courts' "independent power and duty to interpret the law" was well established. Nevertheless, Marshall's opinion in Marbury was the power's first announcement and exercise by the Supreme Court. It made the practice more routine, rather than exceptional, and prepared the way for the Court's opinion in the 1819 case McCulloch v. Maryland, in which Marshall implied that the Supreme Court was the supreme interpreter of the U.S. Constitution. Marbury also established that the power of judicial review covers actions by the executive branch – the President and his cabinet members. However, American courts' power of judicial review over executive branch actions only extends to matters in which the executive has a legal duty to act or refrain from acting, and does not extend to matters that are entirely within the President's discretion, such as whether to veto a bill or whom to appoint to an office. This power has been the basis of many subsequent important Supreme Court decisions in American history, such as the 1974 case United States v. Nixon, in which the Court held that President Richard Nixon had to comply with a subpoena to provide tapes of his conversations for use in a criminal trial related to the Watergate scandal, and which ultimately led to Nixon's resignation. Although it is a potent check on the other branches of the U.S. government, the power of judicial review was rarely exercised in early American history. After deciding Marbury in 1803, the Supreme Court did not strike down another federal law until 1857, when the Court struck down the Missouri Compromise in the now-infamous case Dred Scott v. Sandford, a ruling that contributed to the outbreak of the American Civil War. ^ The crucial votes giving Jefferson his close victory came from the Southern states—including his home state of Virginia—and their "slavery bonus" from the Three-Fifths Compromise of the U.S. Constitution, which allowed Southern states to include three-fifths of their slave population as part of their total citizen population when determining apportionment in the Electoral College and U.S. House of Representatives. ^ Due to illnesses, Justices William Cushing and Alfred Moore did not sit for oral argument or participate in the Court's decision. ^ a b c d Chemerinsky (2015), p. 37. ^ a b McCloskey & Levinson (2010), p. 25. ^ a b Chemerinsky (2015), pp. 37–38. ^ a b Pohlman (2005), p. 21. ^ a b c d e f g Chemerinsky (2015), p. 38. ^ a b c Chemerinsky (2015), pp. 39–40. ^ a b c d e Chemerinsky (2015), p. 42. ^ a b c d e Epstein (2014), p. 89. ^ McCloskey & Levinson (2015), pp. 23–24. ^ a b Paulsen et al. (2013), p. 140. ^ Brest et al. (2018), p. 115. ^ Miller (2009), p. 44. ^ Paulsen et al. (2013), p. 141. ^ a b c d Chemerinsky (2015), p. 39. ^ a b c Chemerinsky (2015), p. 40. ^ Amar (1989), p. 447. ^ Amar (1987), pp. 1485–86. ^ Amar (1987), p. 1486. ^ Brest et al., pp. 124–25. ^ Chemerinsky (2015), p. 40, quoting Marbury, 5 U.S. at 163. ^ U.S. Senate Commission on Art, Office of Senate Curator, "The Old Supreme Court Chamber, 1810–1860", S. Pub. 113-3. ^ a b c d Chemerinsky (2015), p. 41. ^ Chemerinsky (2012), pp. 3, 9 (quoting U.S. Constitution, Article III, Section 1). ^ Van Alstyne (1969), p. 15. ^ Nowak & Rotunda (2012), § 1.3, p. 50. ^ Fallon et al. (2015), pp. 69–70. ^ Currie (1997), p. 53. ^ Tribe (2000), p. 207. ^ Tribe (2000), pp. 207–08. ^ Prakash & Yoo (2003), p. 914. ^ a b Tribe (2000), p. 210. ^ Chemerinsky (2015), p. 43, quoting Marbury, 5 U.S. at 176. ^ Quoted in Tribe (2000), p. 210. ^ Marbury, 5 U.S. at 177, quoted in Chemerinsky (2015), p. 42. ^ a b Chemerinsky (2015), p. 43. ^ Nowak & Rotunda (2012), § 1.3, pp. 52–53. ^ Marbury, 5 U.S. at 176, quoted in Nowak & Rotunda (2012), § 1.3, p. 51. ^ Epstein (2014), p. 90. ^ Tribe (2000), p. 210, quoting Marbury, 5 U.S. at 178. ^ a b Nowak & Rotunda (2012), § 1.3, p. 53. ^ a b c Chemerinsky (2015), p. 44. ^ a b c McCloskey & Levinson (2010), p. 26. ^ Tribe (2000), p. 208, note 5. ^ a b c Nowak & Rotunda (2012), § 1.4(a), p. 55. ^ Fallon et al. (2015), p. 69. ^ Chemerinsky (2015), pp. 44–45. ^ a b Nowak & Rotunda (2012), § 1.4(a), p. 54. ^ a b Brest et al. (2018), pp. 133–34. ^ Nowak & Rotunda (2012), § 1.4(a), pp. 55–56. ^ Pfander (2001), pp. 1518–19. ^ a b c Nowak & Rotunda (2012), § 1.4(a), p. 56. ^ Van Alstyne (1969), p. 1. ^ Treanor (2005), p. 556. ^ Cornell & Leonard (2008), p. 540. ^ Paulsen (2003), p. 2707. ^ Cornell & Leonard (2008), p. 542. ^ Tribe (2000), p. 179. ^ Chemerinsky (2015), p. 45. Amar, Akhil Reed (1987). "Of Sovereignty and Federalism". Yale Law Journal. 96 (7): 1425–1520. Amar, Akhil Reed (1989). "Marbury, Section 13, and the Original Jurisdiction of the Supreme Court". University of Chicago Law Review. 56 (2): 443–99. doi:10.2307/1599844. JSTOR 1599844. Chemerinsky, Erwin (2012). Federal Jurisdiction (6th ed.). New York: Wolters Kluwer. ISBN 978-1-4548-0402-4. Currie, David P. (1997). The Constitution in Congress: The Federalist Period 1789–1801. Chicago: University of Chicago Press. ISBN 9780226131146. Epstein, Richard A. (2014). The Classical Liberal Constitution: The Uncertain Quest for Limited Government. Cambridge, Massachusetts: Harvard University Press. ISBN 978-0-674-72489-1. Frankfurter, Felix (1955). "John Marshall and the Judicial Function". Harvard Law Review. 69 (2): 217–38. doi:10.2307/1337866. JSTOR 1337866. McCloskey, Robert G.; Levinson, Sanford (2010). The American Supreme Court (5th ed.). Chicago: University of Chicago Press. ISBN 978-0-226-55686-4. Miller, Mark Carlton (2009). The View of the Courts from the Hill: Interactions Between Congress and the Federal Judiciary. Charlottesville: University of Virginia Press. ISBN 9780813928104. Prakash, Saikrishna; Yoo, John (2003). "The Origins of Judicial Review". University of Chicago Law Review. 70 (3): 887–982. doi:10.2307/1600662. JSTOR 1600662. Tribe, Laurence H. (2000). American Constitutional Law (3rd ed.). New York: Foundation Press. ISBN 978-1-56662-714-6. Van Alstyne, William (1969). "A Critical Guide to Marbury v. Madison". Duke Law Journal. 18 (1): 1–49. Smith, Jean Edward (1989). The Constitution And American Foreign Policy. St. Paul, MN: West Publishing Company. ISBN 978-0-314-42317-7. Irons, Peter H. (1999). A People's History of the Supreme Court. Penguin Books. pp. 104–107. ISBN 978-0-14-029201-5. Tushnet, Mark (2008). I dissent: Great Opposing Opinions in Landmark Supreme Court Cases. Boston: Beacon Press. pp. 1–16. ISBN 978-0-8070-0036-6. Sloan, Cliff; McKean, David (2009). The Great Decision: Jefferson, Adams, Marshall and the Battle for the Supreme Court. New York, NY: PublicAffairs. ISBN 978-1-58648-426-2. Charles Lee (1758 – June 24, 1815) was an American lawyer from Virginia. He served as United States Attorney General from 1795 until 1801 and Secretary of State ad interim from May 13, 1800, to June 5, 1800.Charles was born to Henry (1730–1787) and Lucy (Grymes) Lee on his father's plantation of Leesylvania in Prince William County, Virginia. He was the third of eleven children and a younger brother of General Henry "Light Horse Harry" Lee, making him the uncle of Robert E. Lee. Another brother was Congressman Richard Bland Lee. A third cousin was Zachary Taylor. He graduated from the College of New Jersey (later Princeton University) in 1775, and then read law with Jared Ingersoll in Philadelphia before returning to Virginia.Charles married Anne Lee (December 1, 1770 – September 9, 1804), his second cousin and the daughter of Richard Henry Lee (his first cousin once removed), in 1789. Before her death in 1804 the couple had six children; Anne Lucinda Lee (1790–1845), infant son (Arthur) Lee (1791–1791), Richard Henry Lee (February–March 1793), Charles Henry Lee (b. October 1794), William Arthur Lee (September 1796 – 1817), and Alfred Lee (1799–1865). He married a second time in 1809, to Margaret Scott (1783–1843), and had three more children in this union; Robert Eden Lee (1810–1843), Elizabeth Gordon Lee (1813–1892), and Alexander Lee (1815–1815). President George Washington appointed Lee the Attorney General after William Bradford died in office. After Senate approval he took office on December 10, 1795, and served through the rest of the administration. He was continued in office by John Adams and served through the entire Adams administration until February 19, 1801. During his term in office Lee lived in Alexandria, which was then part of the capital district. He was an early advocate for the return of the southern part of the District of Columbia to Virginia, which finally happened in 1847. After his time as Attorney General, he became the port officer for the District of the Potomac and among the most prominent trial lawyers in Northern Virginia and the District of Columbia. He declined Thomas Jefferson's offer to appoint him a justice of the Supreme Court. Lee died in 1815 in Fauquier County, Virginia, aged 56 or 57, and is buried in the Warrenton Cemetery in Warrenton. The Constitutional Court of the Republic of Bashkortostan was established pursuant to Part 1 of Art. 15 Law of the Republic of Bashkortostan "On the Constitutional Court of the Republic of Bashkortostan" in 1996 as the Constitutional Court in the Republic of Bashkortostan. The Court consists of a chief justice and eight associate justices who are nominated by the Head and confirmed by the Kurultay. Many countries do not have separate constitutional courts, but instead delegate constitutional judicial authority to their supreme court. Nonetheless, such courts are sometimes also called "constitutional courts"; for example, some have called the Supreme Court of the United States "the world's oldest constitutional court" because it was the first court in the world to invalidate a law as unconstitutional (Marbury v. Madison), even though it is not a separate constitutional court. The Court meets in the Republic House in Ufa. The Parthenopean Republic constitution of 1799, written by Mario Pagano, envisaged such a body ("eforato"), but lasted only 6 months. Constitutional review, or constitutionality review or constitutional control, is the evaluation, in some countries, of the constitutionality of the laws. It is supposed to be a system of preventing violation of the rights granted by the constitution, assuring its efficacy, their stability and preservation. Cooper v. Aaron, 358 U.S. 1 (1958), was a landmark decision of the Supreme Court of the United States, which denied the Arkansas School Board the right to delay desegregation for 30 months. On September 12, 1958 the Warren Court handed down a per curiam decision which held that the states are bound by the Court's decisions and must enforce them even if the states disagree with them, which asserted judicial supremacy established in Marbury v. Madison. The decision in this case upheld the rulings in Brown v. Board of Education and Brown II which held that the doctrine of separate but equal is unconstitutional. Hylton v. United States, 3 U.S. (3 Dall.) 171 (1796), is an early United States Supreme Court case in which the Court held that a yearly tax on carriages did not violate the Article I, Section 2, Clause 3 and Article I, Section 9, Clause 3 requirements for the apportioning of direct taxes. The Court concluded that the carriage tax was not a direct tax, which would require apportionment among the states. The Court noted that a tax on land was an example of a direct tax that was contemplated by the Constitution. The case is also significant for being the first case by the Supreme Court to rely on judicial review, later formally established by Marbury v. Madison (1803), to decide whether a statute of Congress was unconstitutional. John James Marshall (September 24, 1755 – July 6, 1835) was an American politician and lawyer who served as the fourth Chief Justice of the United States from 1801 to 1835. Marshall remains the longest-serving chief justice and fourth-longest serving justice in Supreme Court history, and he is widely regarded as one of the most influential justices to ever sit on the Supreme Court. Prior to joining the Supreme Court, Marshall served as the United States Secretary of State under President John Adams. Marshall was born in Fauquier County, Virginia in 1755. After the outbreak of the American Revolutionary War, he joined the Continental Army, serving in numerous battles. During the later stages of the war, he was admitted to the state bar and won election to the Virginia House of Delegates. Marshall favored the ratification of the United States Constitution, and he played a major role in Virginia's ratification of that document. At the request of President Adams, Marshall traveled to France in 1797 to help bring an end to attacks on American shipping. In what became known as the XYZ Affair, the government of France refused to open negotiations unless the United States agreed to pay bribes. After returning to the United States, Marshall won election to the United States House of Representatives and emerged as a Federalist leader in Congress. He was appointed secretary of state in 1800 after a cabinet shake-up, becoming an important figure in the Adams administration. In 1801, Adams appointed Marshall to the Supreme Court. Marshall quickly emerged as the key figure on the court, due in large part to his personal influence with the other justices. Under his leadership, the court moved away from seriatim opinions, instead issuing a single majority opinion that elucidated a clear rule. The 1803 case of Marbury v. Madison presented the first major case heard by the Marshall Court. In his opinion for the court, Marshall upheld the principle of judicial review, whereby courts could strike down federal and state laws if they conflicted with the Constitution. Marshall's holding avoided direct conflict with the executive branch, which was led by Democratic-Republican President Thomas Jefferson. By establishing the principle of judicial review while avoiding an inter-branch confrontation, Marshall helped cement the position of the American judiciary as an independent and co-equal branch of government. After 1803, many of the major decisions issued by the Marshall Court confirmed the supremacy of the federal government and the federal Constitution over the states. In Fletcher v. Peck and Dartmouth College v. Woodward, the court invalidated state actions because they violated the Contract Clause. The court's decision in McCulloch v. Maryland upheld the constitutionality of the Second Bank of the United States and established the principle that the states could not tax federal institutions. The cases of Martin v. Hunter's Lessee and Cohens v. Virginia established that the Supreme Court could hear appeals from state courts in both civil and criminal matters. Marshall's opinion in Gibbons v. Ogden established that the Commerce Clause bars states from restricting navigation. In the case of Worcester v. Georgia, Marshall held that the federal government had the sole power to deal with Native Americans, and he ordered the release of prisoners held by the state of Georgia. President Andrew Jackson refused to enforce the order, but his administration avoided a confrontation with the Marshall Court by arranging for the pardon of the prisoners. Marshall died in 1835, and Jackson appointed Roger Taney as his successor. The John Marshall House is a historic house museum and National Historic Landmark at 818 East Marshall Street in Richmond, Virginia. It was the home of Chief Justice of the United States John Marshall, who was appointed to the court in 1801 by President John Adams and served for the rest of his life, writing such influential decisions as Marbury v. Madison (1803) and McCulloch v. Maryland (1819). Built in 1790, the house was home to Marshall, his wife Mary Willis Ambler Marshall (known within the family as Polly), and their six children. Marshall lived at the house until his death in 1835.The house is a Federal-style brick building featuring a dining room, parlor, and large parlor/dining room on the first floor and three bedchambers on the second. It was originally surrounded by an outbuildings including a law office, kitchen, laundry, and stables and sat on a full city block in Richmond's fashionable Court End residential neighborhood. Marshall's neighbors included the attorney John Wickham, who defended Aaron Burr in Burr's infamous treason trial. John Williams (March 14, 1731 – October 10, 1799) was a signer of the United States' Articles of Confederation. He was one of the founders of the University of North Carolina. During the American Revolutionary War, Williams was a colonel in the North Carolina militia. In 1777 and 1778, he was a member of the North Carolina House of Commons and served as Speaker of the House. Williams was a member of the Continental Congress in 1778 and 1779. He served as a superior court judge both during the colonial era and after the new state of North Carolina was established in 1776. Sitting alongside other superior court judges as part of a Court of Conference (forerunner to the North Carolina Supreme Court), Williams heard the landmark case, Bayard v. Singleton, which announced the principle of judicial review on the state level before Marbury v. Madison did so on the federal level.The town of Williamsboro, North Carolina, for which he donated the land, is named for Williams.Williams was a first cousin and law partner of Judge Richard Henderson. In the United States, judicial review is the ability of a court to examine and decide if a statute, treaty or administrative regulation contradicts or violates the provisions of existing law, a State Constitution, or ultimately the United States Constitution. While the U.S. Constitution does not explicitly define a power of judicial review, the authority for judicial review in the United States has been inferred from the structure, provisions, and history of the Constitution.Two landmark decisions by the U.S. Supreme Court served to confirm the inferred constitutional authority for judicial review in the United States: In 1796, Hylton v. United States was the first case decided by the Supreme Court involving a direct challenge to the constitutionality of an act of Congress, the Carriage Act of 1794 which imposed a "carriage tax". The Court engaged in the process of judicial review by examining the plaintiff's claim that the carriage tax was unconstitutional. After review, the Supreme Court decided the Carriage Act was constitutional. In 1803, Marbury v. Madison was the first Supreme Court case where the Court asserted its authority for judicial review to strike down a law as unconstitutional. At the end of his opinion in this decision, Chief Justice John Marshall maintained that the Supreme Court's responsibility to overturn unconstitutional legislation was a necessary consequence of their sworn oath of office to uphold the Constitution as instructed in Article Six of the Constitution. The Judiciary Act of 1793 (ch. 22 of the Acts of the 2nd United States Congress, 2nd Session, 1 Stat. 333) is a United States federal statute, enacted on March 2, 1793. It established a number of regulations related to court procedures. The Judiciary Act of 1789 had created, in addition to the Supreme Court authorised by the Constitution, two lower levels of courts. Federal district courts, each with a district judge, composed the lowest level. Their district boundaries generally matched state lines. Every federal district also fell within the circuit of one of the three second-level courts, the circuit courts. Two Supreme Court justices and one district judge composed each circuit court bench; they traveled to each district to hear cases twice a year, at locations and times specified by statute. In 1792, Supreme Court justices and also the Attorney General, Edmund Randolph, had urged President George Washington to push for changes in this system; he included a call for some changes in his annual address to Congress that November, and a Senatorial committee put a bill forward in January 1793.The first three sections of the 1793 act concerned the structure of the court system. The first section authorised circuit courts to function with only one Supreme Court justice. With some exceptions in outlying areas, Supreme Court justices continued to sit as circuit court judges, one per circuit, until the Judiciary Act of 1891 created the courts of appeals. Since courts with two judges (one Supreme Court justice, one district court judge) could cast tie votes, the second section stated rules for those. The third authorised and regulated special circuit court sessions for criminal cases, to be held at more convenient places or times than the statutory regular sessions offered. The remaining five sections regulated a variety of court practices. Section 4, as requested by Washington, dealt with who could take bail payments. Section 5 made rules for writs of ne exeat and of injunction; the rules for injunctions, such as requiring notice to the target of the injunction, and barring federal injunctions from stopping state court activities, remain largely in effect to this day and are perhaps this bill's most lasting legacy. Section 6 authorised inter-district subpoenas, but these were not to require witnesses in civil cases to travel over 100 miles. Section 7 authorised courts to make their own rules; this codified existing practice, and was a reaction to a House amendment aimed at giving the Supreme Court rule-making authority over all the courts. Section 8 ordered that appraisals of property seized in execution of writs of fieri facias should follow the same rules as appraisals made for the relevant state courts. In some cases, a reference to the "Judiciary Act of 1793" actually points to the Judiciary Act of 1789; for example, the 1789 Act, not the 1793 one, mentions writs of mandamus, critical to the decision in Marbury v Madison. Levi Lincoln Sr. (May 15, 1749 – April 14, 1820) was an American revolutionary, lawyer, and statesman from Massachusetts. A Democratic-Republican, he most notably served as Thomas Jefferson's first Attorney General, and played a significant role in the events that led to the celebrated Marbury v. Madison court case. He served two terms as Lieutenant Governor of Massachusetts, acting as Governor for the remainder of Governor James Sullivan's term after his death in December 1808. Lincoln was unsuccessful in his bid to be elected governor in his own right in 1809. Born in Hingham, Massachusetts, Lincoln was educated at Harvard, and studied law with Joseph Hawley before establishing a law practice in Worcester, Massachusetts. He was active in local politics, and participated in the convention that drafted the Massachusetts Constitution in 1779. He supported Quock Walker, a former slave seeking confirmation of his freedom under that constitution in 1783. He entered national politics with his election to the United States House of Representatives in 1800, but was immediately tapped by Jefferson to become Attorney General. Lincoln served Jefferson as a consultant on the politics of New England, and was influential in the distribution of patronage in the region. He served on a commission that resolved claims emanating from the Yazoo land scandal in Georgia, and advised Jefferson on matters related to the Louisiana Purchase. He returned to Massachusetts, where he remained politically active in the state. He established Republican dominance in Worcester, even though the state was dominated by Federalists. He was elected lieutenant governor under James Sullivan in 1807, but failed to win election in his own right in 1809 in a highly partisan election. He retired from politics in 1811, declining nomination to the Supreme Court because of his health. His descendants were a major influence in Worcester for much of the 19th century. The Midnight Judges Act (also known as the Judiciary Act of 1801; 2 Stat. 89, and officially An act to provide for the more convenient organization of the Courts of the United States) represented an effort to solve an issue in the U.S. Supreme Court during the early 19th century. There was concern, beginning in 1789, about the system that required the Justices of the Supreme Court to "ride circuit" and reiterate decisions made in the appellate level courts. The Supreme Court Justices had often voiced concern and suggested that the judges of the Supreme and circuit courts be divided. President Thomas Jefferson did not want the judiciary to gain more power over the executive branch. Mississippi v. Johnson, 71 U.S. (4 Wall.) 475 (1867), was the first suit to be brought against a President of the United States in the United States Supreme Court. The state of Mississippi attempted to sue President Andrew Johnson for enforcing Reconstruction. The court decided, based on a previous decision of Marbury v. Madison that the President has two kinds of task: ministerial and discretionary. Discretionary tasks are ones the president can choose to do or not to do, while ministerial tasks are ones required by his office: those whose failure to perform could leave him in violation of the Constitution. The court ruled that by enforcing Reconstruction, Johnson was acting in an "executive and political" capacity—a discretionary rather than a ministerial one—and so he could not be sued. The original jurisdiction of the Supreme Court of the United States is limited to a small class of cases described in Article III, section 2, of the United States Constitution, and further delineated by statute. Trevett v. Weeden (1786) was a Rhode Island Supreme Court decision finding state legislation regarding paper currency was violative of the state constitution. The decision set precedent for Marbury v. Madison regarding judicial review. William Marbury (November 7, 1762 – March 13, 1835) was a highly successful American businessman and one of the "Midnight Judges" appointed by United States President John Adams the day before he left office. He was the plaintiff in the landmark 1803 Supreme Court case Marbury v. Madison.